The Dark Knight Rises Movie Review – Surprises! The Dark Knight Rises was a phenomenal conclusion to a phenomenal trilogy. I refrain from using the word perfect because there were a few things that held it back from the unheard of, “perfect” status. The Dark Knight Rises does what few trilogies have done before it – ended in a satisfying way. Many trilogy conclusions are, well, unconclusive; leaving loose ends and many unanswered questions. The third movie in the batman series does no such thing. I cannot thank Christopher Nolan enough for taking the idea of Batman and seeing it through to its true potential. No more horrible movies meant for children with no depth; Batman rises from the ashes of those atrocities to what will likely be legendary status for years to come. It all started with Batman Begins, where Christopher Nolan established a new vision for Batman, instantly banishing all previous movies, and TV shows to the past that we all want to forget. 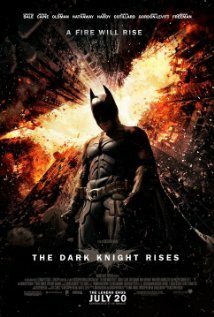 What makes this new incarnation truly amazing is how Nolan is able to take the notion of a superhero and turn it real. The original comics were written to make Batman out to be a normal guy, albeit a very rich and resourceful one, and Christopher Nolan takes this to this fitting extreme. Everything is explained in such a logical way. Can Batman fly? No, he simply glides using special technology. Does he have super strength? No, just great armour and gadgets. Nolan also successfully eliminates all cheese from the movie by envisioning the “batmobile” as something that looks much closer to a tank and by “explaining” Catwoman’s cat ears as being a part of her special goggles. I thought it would have been poetic to have Batman make the ultimate sacrifice to save everyone. It would have been the one way to truly define himself as a hero. The ending was still satisfying but seems like he survived only to provide the cliché happy ending. This bothered me a lot when it was first revealed that Miranda was the mastermind behind the entire evil plan. My fiancée even said that she was the bad guy but I shrugged it off thinking it would just be too obvious. Of course, I was wrong and rather upset at the cheap twist. However, it did tie in fairly nicely with the first one, but it was certainly my least favourite plot point of the entire Batman triology. This I just really didn’t see coming. At the end when it is revealed that is name is Robin I was truly stunned, for two reasons: 1. they did a great job not giving away that he was Robin throughout the movie and 2. they did a great job with Robin. Robin was so lame in all the original Batman incarnations yet they managed to integrate him so well. What do you think about these twists? I have to leave a comment about Miranda (seeing as the spoiler has been complete). I thought that twist was absolutely perfect! For most, that twist was a surprise (which don’t get me wrong, it caught me off guard), but for avid Batman followers, the character of Talia Al Ghul was portrayed perfectly in this movie. Talia and Bruce had a love affair going on in the comics, but she was torn between her love of Batman and her father (ra’j al ghuls) loyalty. Ultimately, her loyalty is to the League of Shadows. I don’t know how I didn’t see it coming! I was concerned about Bain being the criminal mastermind, as we all know, Bain is a henchman, a brute. In the comics, he is part of the League of Shadows in the beginning, and loves Talia (Nolan incorporates this in her speech, BRILLIANT). I’ll leave it at that, because I thought this character was awesome. These movies stuck with the league of shadows plotline, which I guess is what Nolan was going for, a more dark, realistic approach. I would have liked to see more of the iconic villains like Penguin and Riddler, but they knocked some of them off with Scarecrowe, Two Face and of course the Joker in the first two. Most will stick to their guns about the Dark Knight, and that is fair, The Joker was incredible (R.I.P Heath). But you got it right in this review Dave, this ending left no loose ends, and stuck to the characters as they were represented in the comics, and for that reason, I give The Dark Knight Rises an edge over the Dark Knight. I’m a movie buff so I’ll be sharing my thoughts on more posts ;). I’m impressed your fiancée picked up on it. I was completely blind sided haha.